Flexible Screw Conveyor technology is the leading conveyor technology for the widest range of material particle, bulk densities and flow properties. Flexible Screw Conveyors are often the lowest cost means of transferring dry bulk solids from one point to another. The Spiroflow flexible screw conveyor is completely sealed operation. Air isn't used as a conveying medium, there's no risk of dust contamination or humidity from the atmosphere. In addition, the presence of dust can cause not only airborne contamination of other products, but can also pose a threat to the working environment. The rotating flexible screw conveyor spiral, being centralised within the conveying tube, gently moves the material without degrading it. Its unique action also eliminates the risk of mixed product separation. The action of the Spiroflow flexible screw conveyor ensures the material is being constantly remixed. This is particularly important when feeding pre-mixed product to packaging and tabletting machinery. Simplicity of operation is the key element in Spiroflow flexible screw conveyors. The only moving part is the motor driven spiral which rotates within a sealed tube to move the materials along with it. This eliminates the need for any additional operating equipment such as filters or bearings -resulting in a system that's low on installation costs and high on efficiency and performance. The simplicity of the Spiroflow flexible screw conveyor system makes cleaning a simple operation. The electric motor may be reversed to empty the conveyor of residual material which can then be flushed out with water or cleaning solution. 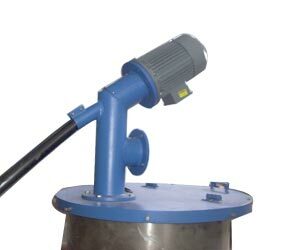 If necessary, the spiral can be quickly removed from the tube, and optional quick release connectors enable rapid dismantling and reassembly to minimise downtime. Some basic facts about Spiroflow flexible screw conveyors. Electric motor: 3 phase, 50/60hz, voltage as specified. Special motors are also available to your specification. Fixed or variable speed. Motor adaptor and spiral connector in mild steel or stainless steel. 45 degree or horizontal outlet assembly in mild steel/painted, or stainless steel. High and low level control. Abrasion resistant polymer outer tube. Flexible screw conveyor spiral in spring steel or stainless steel. Inlet assembly in mild steel/painted, or stainless steel. 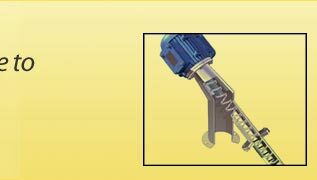 Feed restrictor to regulate material flow. 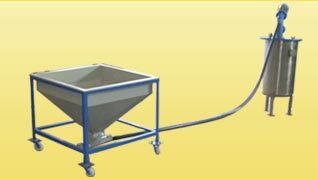 Feed hopper in standard size or to customer's specifications. Spiroflow flexible screw conveyor spiral selection. The ROUND SPIRAL flexible screw conveyor forces some of the solids outwards between the spiral and the tube, which reduces friction and lowers the load on the drive motor. Its gentle tumbling action disperses the product within the tube, preventing separation of mixtures, actually aiding the mixing process. Round spirals provide the best combination of conveying and mixing efficiency, strength and long life. The FLAT SPIRAL flexible screw conveyor, manufactured from rectangular wire, directs more positive forward force in the direction of flow and increases capacity slightly. It is particularly suitable for light, aerated or very fine materials which demand a greater surface area to assist their movement, with less fallback. 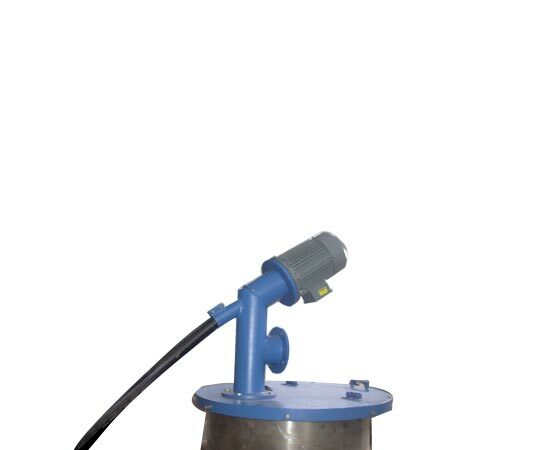 Typical applications would be for talcum powder, fire extinguisher powder, filter aids (e.g. diatomaceous earth). The PRO SCREW bevelled profile flexible screw conveyor is designed for conveying difficult materials like iron oxide, pigments and other caking, smearing or cohesive products. Due to the close tolerance between the tube and spiral, length and conveying capacity are limited. This profile is semirigid, so bends are not permitted. However, steep conveying angles can be achieved. Very light materials that fluidise readily. Conveyors inclined more than 60°. 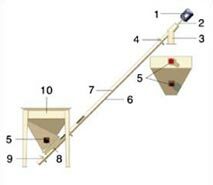 To prevent flooding/ overfeeding of certain solids in short or horizontal conveyors. NOTE : All spirals are heated treated to provide strength and long life. For products with high bulk densities, a heavy duty spiral may be specified, used in conjunction with a steel outer tube for abrasive products. versatility across the widest range of industries. Spiroflow flexible screw conveyors are installed worldwide in a multitude of industries because of their versatility and ability to take a wide range of particle sizes, bulk densities and flow properties in their stride. Food :Hygienic ingredients handling is the fundamental benefit of Spiroflow equipment, designed to satisfy the stringent demands of the food and allied industries. Pharmaceuticals : Accuracy, hygiene and consistent feeding are prime requirements in the pharmaceutical field. Plastics/rubber : Spiroflow solids handling equipment is widely chosen to ensure efficient feeding of moulding, extrusion and mixing machinery in the volume Manufacturing sectors. Chemicals : Spiroflow's long experience within the chemicals industry ensures the safe handling and accurate metering of these often hazardous materials. Water treatment : Spiroflow supplies efficient dosing equipment for hydrated lime, activated carbon and other chemicals used in water treatment. Minerals/ceramics : No bulk handling tasks are more arduous than in minerals and ceramics. Spiroflow equipment is robustly built to meet the most exacting demands.